Risers are commonly used when duct should be run above or below I-beams in the cases where joists change hands or ducts run along the joists. When duct should be run above the I-beam, if possible, I’d recommend joining as many parts and fittings as you can – this trick may make your installation much easier. On the rare occasion duct may keep its height on the longer distance, or could rise up right after it passed an I-beam. 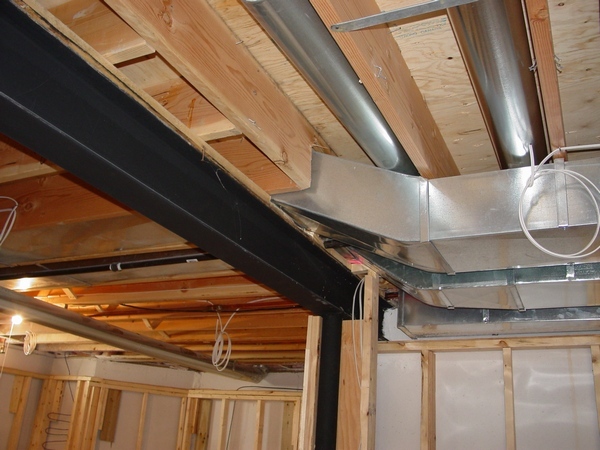 The larger size ducts can’t be fit between joists you have no choice, but run below the I-beams. Also risers could be used for furnace replacements, because you may need to hook up your new cold air return boot to the existing hole in the old duct. In some companies people who know what they are doing make risers and other fittings nice and neat, just like you saw it above, while in the others they make them wrong! So, if you would like to learn how to make risers the right way you may purchase a couple of chapters from my Tutorial for Totally Hand-Made Duct Fittings e-book below. Vertical elbows often used in the cases when you need to penetrate into the joist space and immediately change direction. In some cases it could be a single duct while in the others a larger duct can be split in two. And in the last case the main duct was split immediately after it passed under the I-beam. And finally a vertical elbow can be used as a take-off. Another type of vertical elbows can be used as a riser. The idea behind it is to keep a cold air return drop as tall as possible for a convenient humidifier installation. So, if you would like to learn how to make vertical elbows you may purchase a couple of chapters from my Tutorial for Totally Hand-Made Duct Fittings e-book below or a Tutorial itself as a whole. In this tutorial for the price of only $2.50 you will learn how to make all four parts of this elbow; how to make the Pittsburg seam lock and how to put this elbow together.